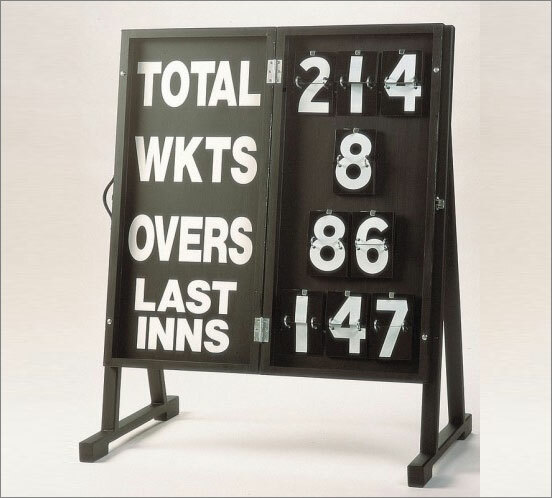 Portascore Folding Cricket Scoreboard - CRA Cricket UK. Sturdy timber Porta Score cricket scoreboard designed to fold into its own carrying case which measures 965mm x 470mm x 76mm deep. The board is designed to be portable and can be used in schools or cricket clubs. When the board is opened this board measures 965mm x 940mm x 37.5mm deep and has smaller telegraph flGP2 over numbers 178mm x 114mm.